Article written by Kristina Holcomb, Director of Communications and Patient Relations for Premier ER, published in the fourth quarter edition of the Greater Waco Business magazine. The Waco community is home to exceptional healthcare providers with a network of options. 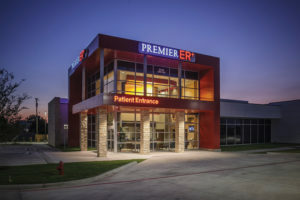 Four years ago, Dr. John Hamilton, CEO and President of Premier ER and Urgent Care, saw the need for an additional option to be offered to the community – there was a growing disconnect between the patient and the physician providing care, and Dr. Hamilton’s desire to bring the connection and experience back to the Waco community was the foundation of Premier ER and Urgent Care. Urgent care clinics are a great resource for unscheduled acute needs during the day when it’s often difficult to get into a Primary Care Physician (PCP) or pediatrician and after hours when those offices are closed. Services for sore throats, sprains, flu and strep tests are examples of what an urgent care clinic can be utilized for. There are more “freestanding” emergency centers opening in the state of Texas. A freestanding emergency room is a 24/7 healthcare facility that provides emergency care in a location that is not attached to a hospital. They are equipped and staffed to the same standards as an emergency department (or ER) in a hospital. If additional care is needed, such as surgery or further observation, the freestanding facility will transfer the patient to the most appropriate next level of care, just as it is done in a hospital-based ER. Premier ER and Urgent Care is fully staffed with experienced doctors and providers, nurses, radiology techs and support staff. Premier is a comprehensive solution to unscheduled care. There are currently five locations in the Waco, Temple/Belton and San Marcos communities. Combining an emergency room and urgent care clinic in one location creates a cost-effective way to receive care with little-to-no wait. The Waco community now has options to go where the patient doesn’t have to decide how big or small the injury or sickness is. Over 70 percent of the patients in Premier leave with just an urgent care bill. Millennials are a larger generation than the Baby Boomers and have shown an interest and desire in changing how things “used to be,” and the Waco community has embraced a lot of change and continues to thrive. More and more employers are moving to high deductible healthcare plans for a variety of reasons. There is now a membership option, Beacon Direct, which is an exclusive membership that focuses on partnering with terrific healthcare and wellness services for a simplified and transparent pricing methodology. The membership can be a great tool for people to either use as a solo option or a perfect complement to a high deductible insurance plan.